Mobile sports betting apps open up all sorts of possibilities for the avid players who enjoy betting on sports. Responsive technology has enabled highly efficient native and web-based mobile betting apps to perform successfully across multiple types of devices, networks, and operating systems. US friendly mobile betting apps provided by licensed offshore sportsbooks have become widely used among sports fans. Until very recently, online sports betting was a no-go in the US. However, on May 14th when the repeal of PASPA officially ushered in the first legal expansion of state regulated sports betting in nearly 26 years, domestic online sportsbooks also became a possibility, as long as their services are not offered across state lines. If the Federal Wire Act is challenged in the same way that PASPA was, then this restriction may also end up getting lifted. Established and dependable mobile sports betting applications for your iPhone or Android smartphone, BlackBerry Playbook or Windows powered tablet provide the same betting opportunities as you have come to expect from your desktop computer. This means no-download responsive technology that rewards you with a visually pleasing experience across all devices and operating systems and a better all-around betting experience. IPhone and Android sports betting apps are offered by legally sanctioned and respected USA offshore online sportsbooks. But those top operators also support Apple tablets, smartphones and mobile PCs powered by the Windows and BlackBerry operating systems. In addition, domestic online sports betting applications are now legal in the US, and as states continue to pass sports gambling legislation, we will see more and more options emerging. 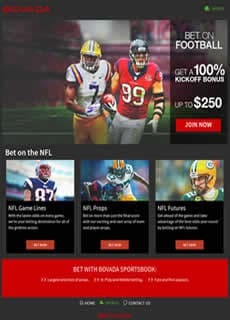 Bovada is our top recommendation for US friendly mobile sports betting. They provide a secure and well designed web-based betting app that is mobile optimized through responsive technology. You get all of the same betting options and account management features through the mobile app that you do when logging in from your laptop or PC. All of these sportsbooks are USA friendly and offer a robust mobile sports betting platform that is compatible with any and all devices. Since we only recommend the biggest and most trusted sports betting brands, they are typically the most well funded operations as well and as such they have no problem spending big time money to develop the best mobile sports betting applications money can buy. Fortunately, the most trusted and respected online sports betting sites offer seamless mobile technology that is compatible with Microsoft's Windows mobile platform. All Windows Phone Operating systems and devices are supported, reg ofardless the size of the display, its resolution, aspect ratio, or the type of Windows mobile product you choose.